In the last post, we saw a paper binding that was basically a glorified wrapper, attached to the textblock by adhesive. This time I am going to look at a structure with earlier roots, that relies mostly on mechanical attachment of the cover to the book block. This binding structure is also interesting in that the textblock and cover are prepared separately, establishing it as a precursor to case binding. Right after our class covered lapped component bindings and stiffened paper cases, we made some laced paper case models. I feel like I should start this one off with a few disclaimers. I have very little experience with historical examples of laced paper bindings – either limp or in-boards. I have not yet read all that much about their historical context, evolution, or typical features. Therefore, this discussion will focus on only one particular structure that, while based on the binding techniques of antiquity, is heavily influenced by modern conservation practice. 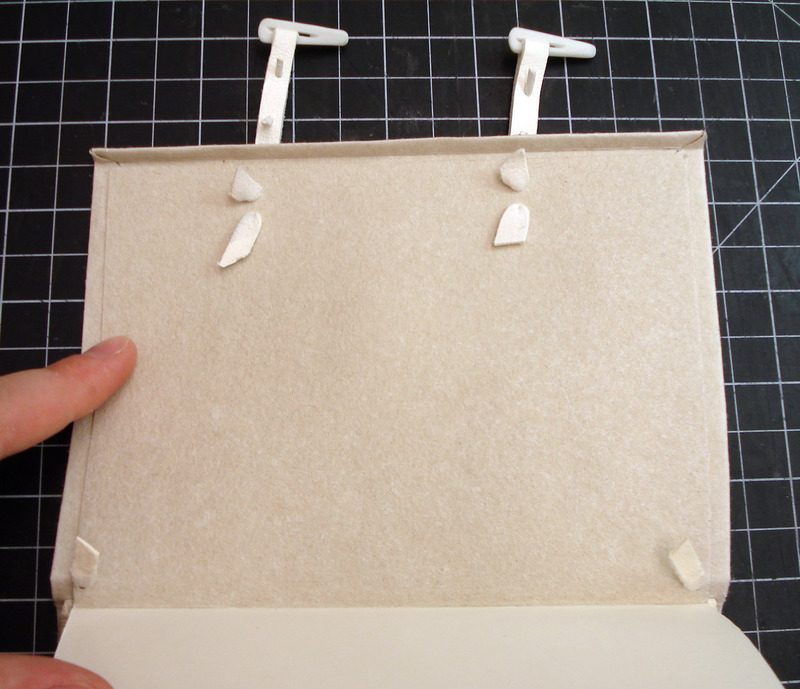 While I was making these paper-covered models, I went ahead and made a limp vellum binding using the same structure. There is significantly more literature available on limp parchment structures, so most of this post is actually derived from those sources. Therefore, I ask you (the gentle reader) to forgive the limitations of this discussion and its deviation from my paper-centric series. Now on to the topic at hand! 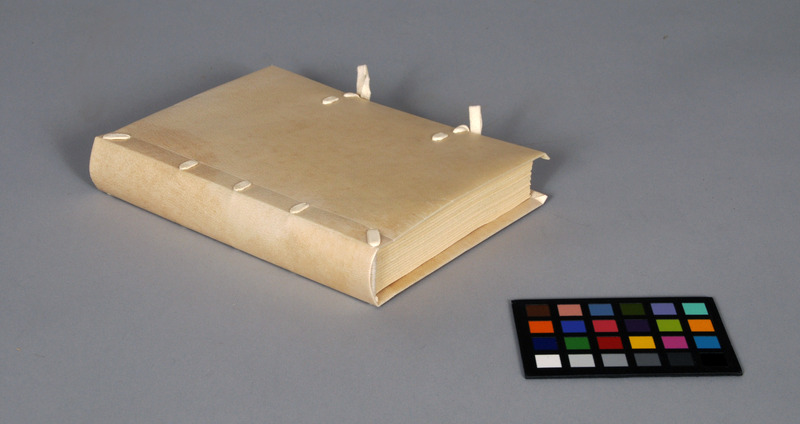 Most bookbinders and conservators will naturally recall the structure pictured above when the term ‘limp vellum’ arises in conversation; however, Lindsay (1991) reminds us that it is a very general term that covers a wide variety of structures (p. 4). Szirmai (2000) mentions limp parchment bindings from as early as the Carolingian era (p. 286), but both he and Clarkson (2005) conclude that their popularity in the thirteenth and fourteenth centuries grew as a result of growing demand for book supply. These sturdy bindings played an important role as an economical and utilitarian alternative to stiff-board bindings in early universities, as well as library and archive collections. Szirmai (2000) describes a variety of structures that rely on different book block to cover attachment methods. In previous blog entries, I’ve covered a few limp structures in which the cover attachment is through primary sewing (here). There are also a number of styles that make use of primary and secondary tackets for this attachment. Many of these early limp structures feature a flat spine that, as we saw in the last post, has a tendency to develop a distorted concave shape. Binders in antiquity resorted to a number of methods to try to get the book to stay square. 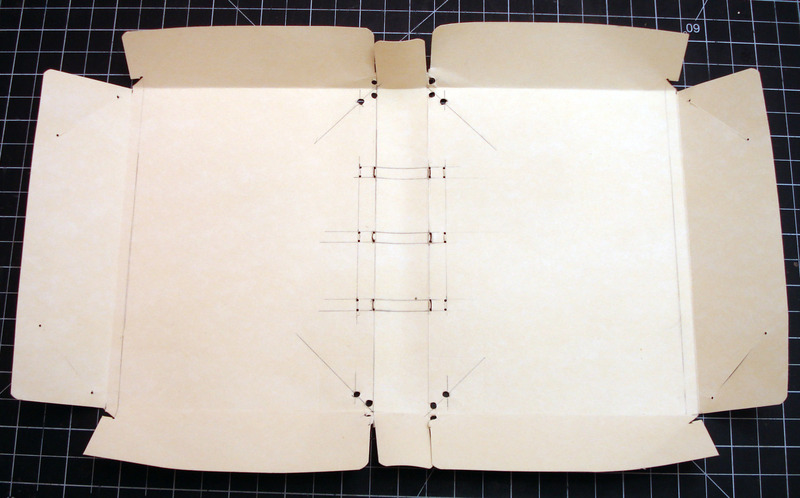 In some cases, the binder would sew through a rigid spine plate (discussed here). Binders were also known, on occasion, to lash wooden sticks or metal rods onto hidden interior sewing supports and then attach the covers with indirect tacketing (see Szirmai, 2000, p. 305 for diagrams). Because the opening of the volume – especially if large – puts a significant strain on the spine, these efforts were largely unsuccessful. Wooden supports would often snap and metal support rods would actually bend to further reinforce the concave round in the spine (Szirmai, p. 314). These flat-back limp structures gradually give way to bindings with “moderately rounded spines, laced-in endband supports and parchment covers with neat turn-ins and pastedowns (Szirmai, 2000, p. 317). The exact origin of limp cover attachment to the book block with laced-in sewing supports is unknown, but the better known examples date from late fifteenth and sixteenth centuries (Clarkson, 2005; Szirmai, 2000). Whether the rounding of the spine developed intentionally or as a natural result of the lacing process, is unclear. Regardless, a rounded spine does tend to keep its shape over the life of the book and is a far better solution to textblock bulge than stiff plates or rods. 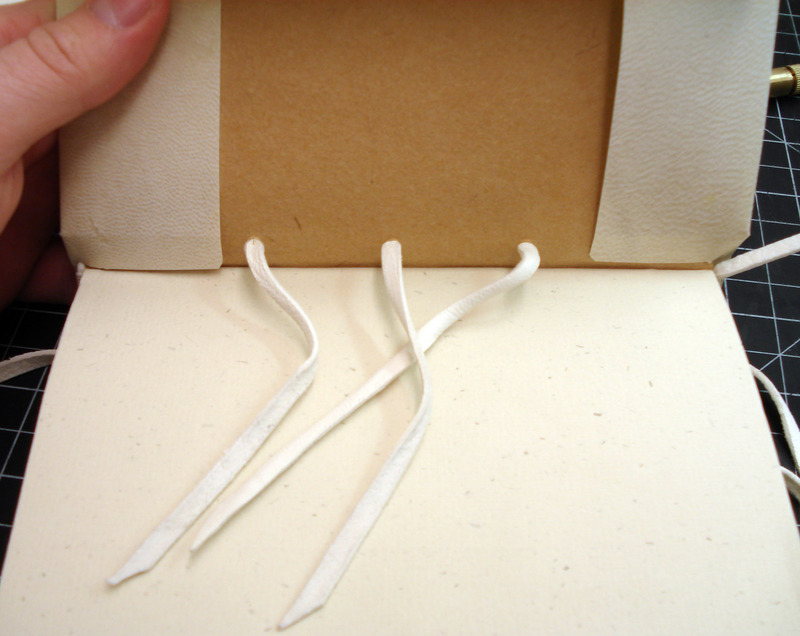 Several features of the laced models of limp bindings seem common from the literature; most notably hooked endsheet construction, sewing on cords or thongs, and thick parchment covers with two or three slits at the joint for lacing. Rhein (1942) describes incunabula from Amplonian Collection at Erfurt as having single, reused parchment leaves hooked around the outer sections. Clarkson (2005) includes descriptions of several interesting endsheet structures for conservation rebinding; including of a hooked endsheet with “expanding gusset” to relieve unwanted tension in pasted down endsheets, as well as a parchment leaf with alum-tawed hinge for non-adhesive case attachment (p. 12-14). My models all used non-adhesive endsheet attachment (discussed below). I used either single leaves of heavy handmade paper from the University of Iowa or a single folio section (like in the previous posts) for my paper case models. Szirmai (2000) reports that sewing was done all along, and occasionally packed around the supports (p. 312). The literature describes two methods of cover attachment: either single supports, laced through in a straight line across the cover or double (or split) supports that are each laced through at an angle, forming a ‘V’ pattern (see Clarkson, 2005). All of my models are sewn on single alum-tawed goatskin thongs as you would tapes. While modern sewn endbands are merely a decorative feature, late medieval and Renaissance endbands had a structural component. Primary sewing firmly attached the core to the book block through tie-downs in the center of each section. 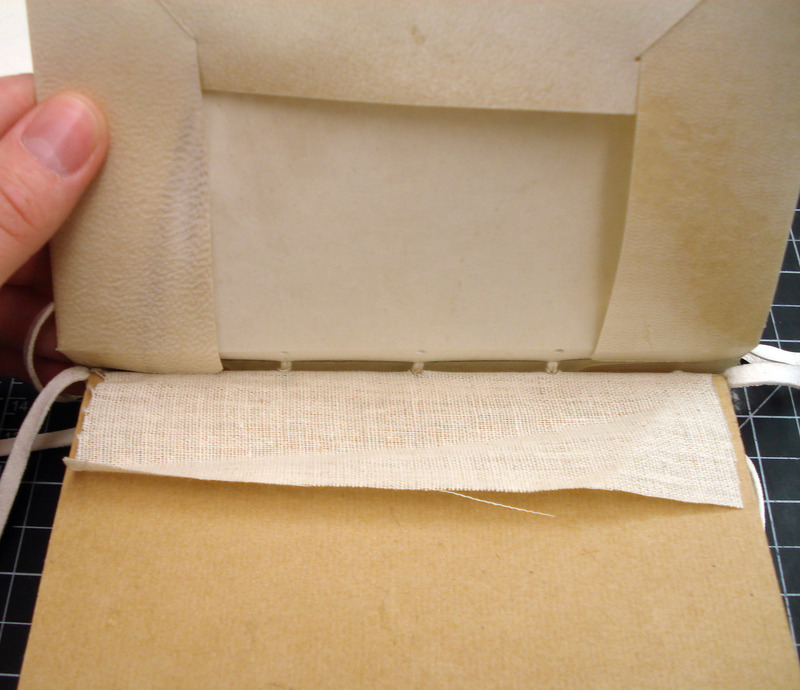 The endband sewing was often done through the spine lining (as above). In the Italian volumes that were commonly used in libraries and archives, endbands are plain, with a back bead. The endband cores were laced into the covers, while the remaining sewing supports were “stubbed to the width of the textblock” (Clarkson, 2005, p. 16). The German variety from the same period went in the opposite direction, however, often have no endbands at all, but laced sewing supports (Szirmai, p. 315). Both Lindsay (1991) and Greenfield & Hill (1990) have excellent instructions for making this endband. The next step in making this structure is to prepare the cover. Lindsay’s (1991) article does an excellent job of describing the formation of a modern cover that uses cuts and tabs for the mechanical attachment of the turn-ins at the corners. Clarkson (2005) includes diagrams of two other versions with interlocking tabs. Historically, I think the turn-ins were sometimes just pasted down. As the cuts are somewhat complex and vellum is an expensive material to waste, Lindsay recommends making a paper template first (above). I used 10 pt folder stock for mine. All the measurements are taken directly from the textblock, resulting in a cover that is an exact fit. The vellum is cut out according to the paper template; Lindsay recommends cutting windows out of the paper template, so that the best part of the skin may be chosen. The sewing supports are first laced out through the holes at the point of the shoulder. These holes are much smaller than the width of the supports, so that the thongs are held very securely after lacing. When the sewing supports are laced back through to the inside of the cover, they also pass through the extended spine lining and endsheet material. After trimming them back a bit, they are hidden underneath the outermost leaf, which is tucked under the turn-ins. The lacing of the endband cores and the fasteners keeps the whole assembly firmly in place. The yapp edge and fore-edge fasteners are a distinctive and charming feature of this binding style. They serve to keep the book in a nice, self-contained package and protect the textblock from drops or bumps. Szirmai (2000) indicates that most fastenings were historically chamois leather, but that metal fasteners are sometimes encountered. Clarkson (2005) states that many types of fore-edge tie anchorage designs were in use by the sixteenth century and double as tackets for non-adhesive endsheet structures (p. 10). Szirmai includes several helpful diagrams of these systems and their attachment to the covers (p. 315). I made a different types of fastener for each of my models to see how they worked. The simplest design is the bow (above), which is merely alum-tawed strips anchored to each cover and tied. While simple to construct, the main disadvantage of this system is that “many people do not have the patience to tie the bow” (Clarkson, 2005, p. 10). A second fastener consists of a toggle attached to the lower board that hooks around the fore-edge and catches on loops anchored into the upper board. The forming of the toggle is depicted in Szirmai (2000). It is relatively simple to make – two holes are punched a few inches from the end of a strip of tawed skin and the end is rolled up to the first hole. The remainder is laced through the two holes and pulled until the roll is tight. Overall, I am not satisfied with this fastening system. I’ll admit that my execution could be better, but it seems that the toggles can be quite difficult to get in and out of the loops. I suppose they might function better when made out of different skin; it seems the tawed skin is too puffy and the toggle sticks inside the loop when attempting to pull it through. I will need to find and examine a set that function well to really know, however. Finally, there is the ‘peg and frog’ fastening system. While this one is, by far, the easiest to loosen and secure, Clarkson (2005) reminds us that it originates in Asia and may clash with the cultural or historical consistency of the binding. Regardless, the peg is made of bone and the loop of the strap is secured with small laces of alum-tawed skin. I used a lok-eye needle to get the tiny laces into the strap (below). The image below also illustrates an alternative form of mechanical endsheet attachment – this time, outside of the turn-ins. Limp parchment bindings with laced-on covers are incredibly durable, as witnessed by the number of bindings that survived the 1966 flood of the Florence Biblioteca Nazionale (Clarkson, 2005). This has led to the widespread adoption of this structure for conservation rebinding (Clarkson 1975; 1982). Further efforts to adapt the structure for conservation work have also been made, the most popular of which being the design by Robert Espinoza (1993). This binding operates very differently than the lapped component, in that it does not really lie flat . Both Clarkson (2005, p. 11) and Barrios (2006, p. 24) note that this structures functions best on thinner books, since the binding functions best in the hands rather than on a lectern. While this structure is relatively easy to complete with paper, it is deceptively hard to do well in vellum. I am not yet able to really describe why it works out well sometimes and not others – but I think that variation can be attributed to the selection of the skin for the book. The thickness, flexibility, and overall combination of forces within the skin itself have to be examined and chosen specifically for the book block. If the selection is haphazard, the binding will feel off. Clarkson (2005) concludes that this a master binding, not a student one. The 16th century form of this binding is considered by Clarkson to be the high point of the structure; as decoration takes precedence over structure in the following years, the quality of these bindings suffers a gradual decline. For some interesting historical examples of limp vellum bindings from the thirteenth century to the present, I would suggest browsing through the online exhibit created by Doug Rice. Barrios, P. (2006). Notes on the limp vellum binding. The Bonefolder 2(2), 24-27. Clarkson, C. (2005). 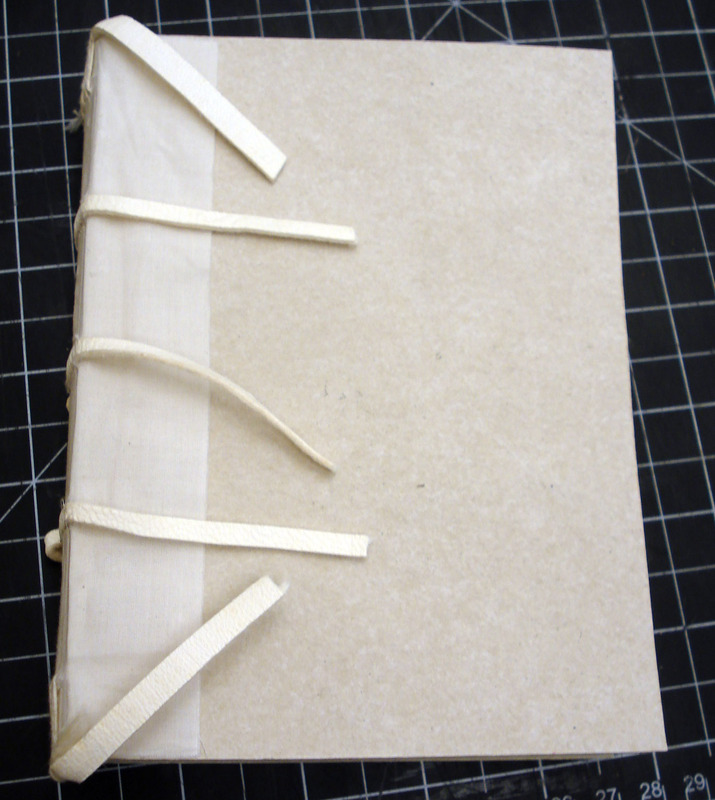 Limp Vellum Binding. Oxford: Christopher Clarkson. Espinosa, R. (1993). 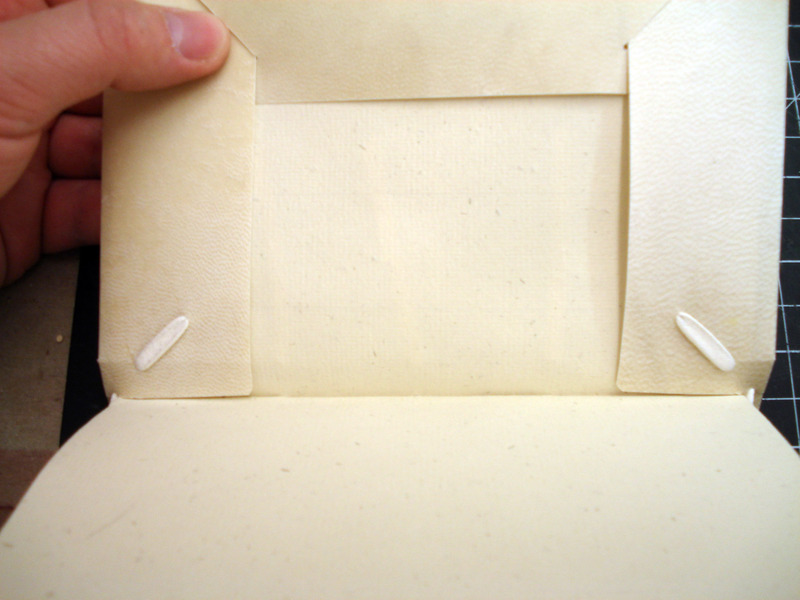 The limp vellum binding: A modification. The New Bookbinder, 13, 27-38. Lindsay, J. (1991). 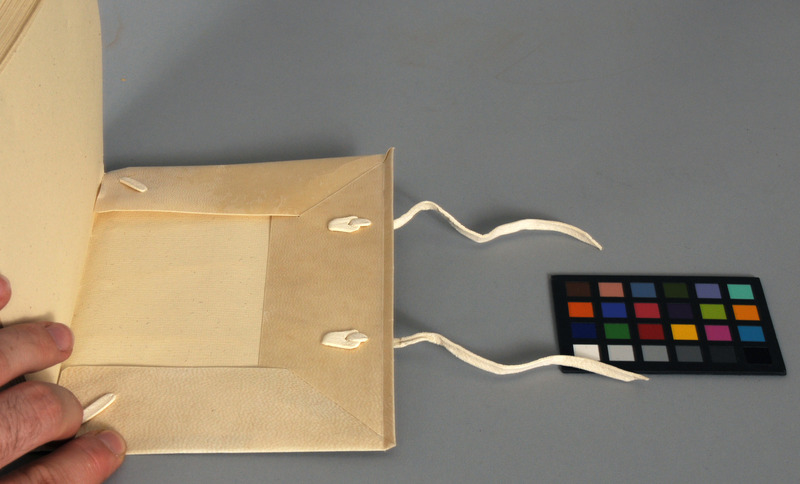 A limp vellum binding sewn on alumn-tawed thongs. The New Bookbinder, 11, 3-19. Pickwoad, N. (1995). The interpretation of bookbinding structure: An examination of sixteenth-century bindings in the Ramney collection in the Pierpont Morgan Library. The Library, Sixth Series, 17, 209-249. Rhein, A. (1942). Alte heftungen in pergamentumschlange. Zu einem katalog “Die Wiegendruckeinbande der Stadtbucherie Erfurt”. Archiv fur Buchbinderei, 42, 11-13. Szirmai, J. A. (2000). The archaeology of medieval bookbinding. Aldershot : Ashgate. Thank you for the comment, Rosemarie! I really love this structure – it is a pleasure to use and quite durable. Good luck! I quite enjoyed reading your article. I am looking for more information on the historical endband techniques. I would like to understand how the endbands were laced in, to provide further structural support for the book. If you have any tips or resources you could recommend, I would very much appreciate it. Thanks for the comment, Maus. The laced-in endband is actually a persistent feature for many medieval book structures probably as early as the 11th century. Any resources (like Szirmai) on wooden boards bindings, such as Carolingian, Byzantine, or Gothic style, should discuss them. 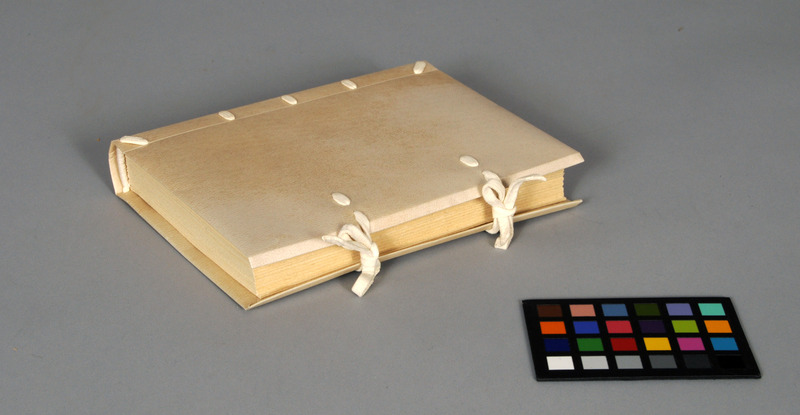 The function is a little different for a rigid board binding and a flexible one like these parchment bindings – but it essentially just provides another point of attachment at the head and tail, reducing potential for torsion across the textblock. Thank you very much. I will look into your suggestion. I am looking into using laced in endbands, but I would like to make sure that the tension is distributed properly. I would think it’s easy to end up with incorrect tension, and a split binding. If you are using leather or parchment as your covering material, it can actually take a great deal more tension than you would expect. Tawed skin endband cores will likely split before the binding. The danger is more for paper bindings, but you should be fine if you are using a thick handmade paper.